You select the information to be displayed in the tooltip texts, no matter where they are to appear (operation, work center, resource, etc....). You define the bar labels – based on the data stored in NAV. You sort orders, work centers, due dates, etc. in ascending or descending order, depending on whether you want to find orders faster, e.g., or have to keep an eye on due dates. Note: the configuration of the tooltip text can´t be done in the NAV web client, but only in the Windows Client. You focus on certain operations and look at them from the order or capacity view perspective by switching views seamlessly. If you have production order lines with many operations you use semi-automatic scheduling as support and specify whether, when an operation is moved, its succeeding or preceeding operations are moved as well. As of now, the new version can be downloaded from our partner portal. For more than 20 years, NETRONIC has been engaging in the development of intelligent graphical planning boards, and – among others - provides Gantt add-ins for production, service, and jobs that are specifically designed for Microsoft Dynamics NAV. 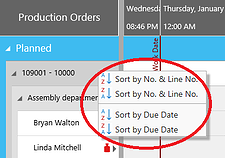 Not familiar with our visual scheduling add-ins for Dynamics NAV? Watch the introductory webcast.